Fort Lauderdale, Fla., August 05, 2015 – For most children, the first day of school is an exciting time complete with new clothes and back-to-school gear. But for kids in families where money is tight, the experience can be just the opposite. 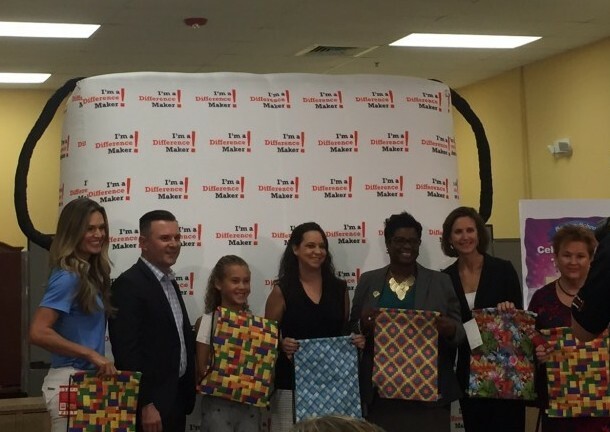 To make a difference to deserving children like these at the start of the new school year, the Office Depot Foundation will donate 7,500 colorful new sackpacks containing essential school supplies to nonprofit organizations, schools and agencies in Fort Lauderdale and Broward County. The Foundation – the independent charitable giving arm of Office Depot® (NASDAQ:ODP) – will make the donations during a special Back-to-School Celebration beginning at 10:00 a.m. on Wednesday, August 5 (8/05), at the Office Depot store located at 6325 N. Andrews Ave. in Fort Lauderdale. The Foundation is celebrating the 15th year of its award-winning National Backpack Program in 2015 by donating approximately 200,000 sackpacks to children in all 50 states and internationally. During the past eight years alone, more than 60,000 Broward County kids have received tools they need to succeed in school through this program. By the end of this year, Office Depot and the Office Depot Foundation will have given away more than 3.7 million backpacks and sackpacks since the National Backpack Program began in 2001. Mount Bethel Human Services Corporation, Inc. The specially designed drawstring sackpacks come in seven bright and colorful designs that are new for 2015. Each one includes a zippered pouch containing a pen, pencil, pencil sharpener, eraser, six-inch ruler and four crayons. The sackpacks do not have any Office Depot Foundation or Office Depot logos or markings. To deliver sackpacks directly to children, the Foundation is hosting Back-to-School Celebrations in more than 20 cities across the U.S. in July and August. Thousands of sackpacks are being given to kids through the Office Depot Foundation’s continuing partnerships with nine nonprofit organizations serving children nationally and globally. The Foundation is collaborating with the AARP Experience Corps, Community Anti-Drug Coalitions of America (CADCA), the National Court Appointed Special Advocates (CASA) Association, Feed the Children, Food For The Poor, the Kids In Need Foundation, the National Foundation for Women Legislators, Operation Homefront and Samaritan’s Feet International. For the seventh consecutive year, children of the Navajo Nation in Arizona will receive sackpacks. Again this year, the Office Depot Foundation has teamed up with Comcast and its Internet Essentials initiative, the nation’s largest and most comprehensive broadband adoption program. Internet Essentials aims to help bridge the digital divide for the millions of students and families who don’t have broadband access and may be missing out on important educational resources.